Joe Mouawad from Beirut, Lebanon has won the European Poker Tour event in London, banking £611,520. Germany’s Florian Langmann, who is not a woman, runner up’d. Another German, Marcel Baran, finished third. With his win at the Vic, the 47-year-old Mouawad joins the ranks of other Lebanese born poker players, including Joe Hachem, Freddy Deeb and Sammy Farha, who have made names for themselves in the poker world without having names that sound very Lebanese to us. Like Hakim or Bashir or Rafiq. 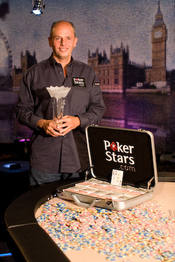 For an excellent recap of Mouawad’s win head over to PokerStars Blog. For full results and reporting from the EPT London, go here. * That maybe didn’t happen.